Should I train or retire this warrior? 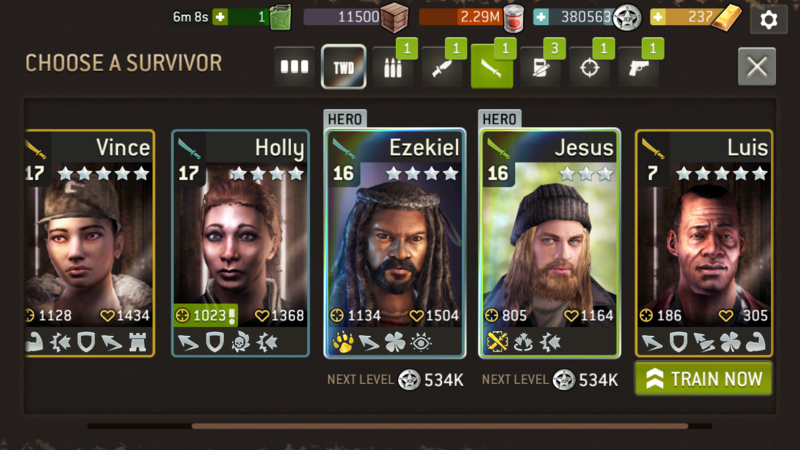 Luis is my first legendary call and I don’t have many warriors, but I’m not sure about the traits (everyone seems to hate the bullet dodge). Is he worth it? I like to have retaliate on warriors and power strike if I can. Personally I wouldn't invest into him. I agree, I would say retire him and invest in Holly. Hopefully she has a good final trait. Don't mind the bullet-dodge to much. The lack of retaliate is a bigger problem. Holly is really good actually. Even if the last trait is bogus, she still would be a keeper. Power-strike or luck would really finish it. Get rid of Luis and invest on Holly. Keep Vince until something better comes along. Put retaliate on Luis instead of bullet dodge, you have a good survivor. As @Xenathewarrior said, I would also prefer ditching him for tokens and creating a slot. I like Vince as he has acceptable traits and is good for upgrading. Though people hate defensive stance, but I favor it. Holly is also good and would be super, if the fifth trait is strong or any other desirable trait.